Years ago I translated Frère Jacques into Klingon for a linguistic party. yIvem yaq yaS! yIvem yaq yaS! bum! bum! bum! bum! bum! bum! Literally, this means: Wake up, officer Yaq! Are you sleeping? Don’t you hear the torpedoes all over the place? Boom! Boom! Boom! I think most of it should be correct Klingon, but I’m only guessing that ‘boom’ would be bum. 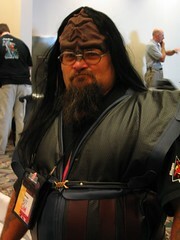 If anybody reading this speaks Klingon more fluently than me, I’d be happy to correct any errors. Update: Here’s the lyrics in IPA for those who are not aware of the conventions of the Klingon transliteration scheme: /jɪvɛm jɑqʰ jɑʃ – mbɪqʰoʊŋʔɑʔ – pʰɛŋmɛj ɳɖɑqχojmbɛʔːɑʔ – mbuːm mbuːm mbuːm/.